It's been awhile since I last post, I'm a bit carried away with testing out some of my FKLI techniques on CPO futures. So far, I'm at a baby losses but my fibo tell me CPO is gonna come down to at least 3,090-3,100, or even 3,060, if it's willing to correct seriously. I never know, as long as my STOP is in place, I will just let it ride. Let's see if my fibo applies to CPO then. Anyway, back to our dear manipulated-thus-predictable KLCI index futures. I did an analysis up to the closing price just now (1230h, July 09). Took the time to marked my summary in numbers, coz I received some personal comments saying that I confused them by using too much of JARGON trading terms/techniques, & statements jumping around. Well well, haha, I'm a trader, though I love to produce nice work, my analysis objective is to MAKE MONEY. If my charts are MAKING ME MONEY, they have served their purpose. Anyhow, I do understand how newbies will feel when they see a chart with lines & curves & etc...., because I WAS a newbie too once upon a time. My advice is, don't care, just read & see & read & see, you will on ONE FINE DAY, find a light bulb over your head & TAaDAaa.....everything will snap into position for you. Enjoy the money-making lines & curves! 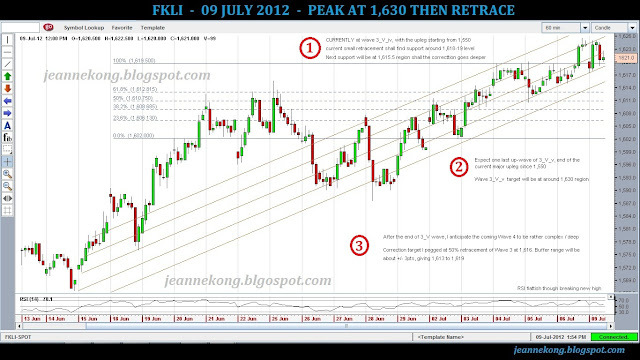 KLCI Futures - New peak @1,630 achieved! !